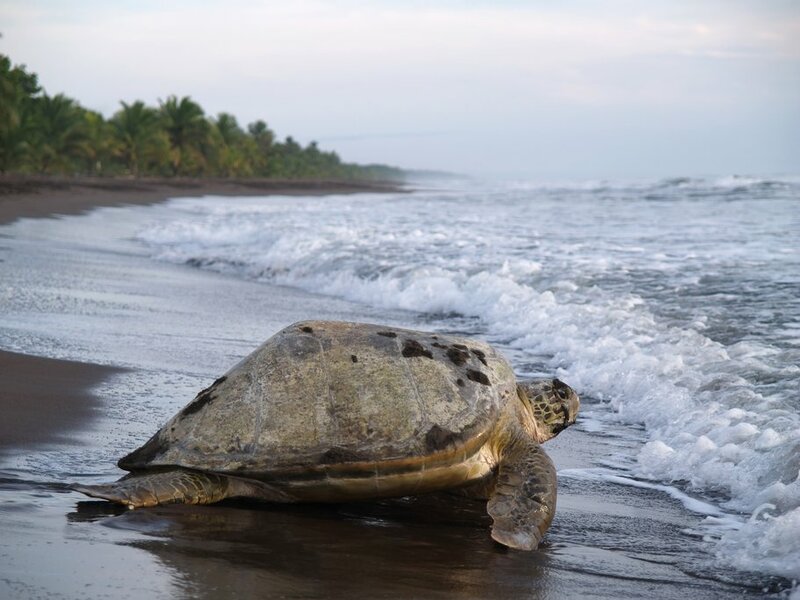 Perfect for travelers looking to hike and observe wildlife, this itinerary starts and ends in San José and includes many of the Caribbean coast's best destinations—including a famous sea turtle nesting site in Tortuguero and Cahuita National Park. Compared to the Pacific Coast, the Caribbean side tends to be less crowded, with more cultural diversity. From nature treks to pristine beaches, this itinerary offers something for everyone who wants to experience splendid scenery with a laid-back feel. 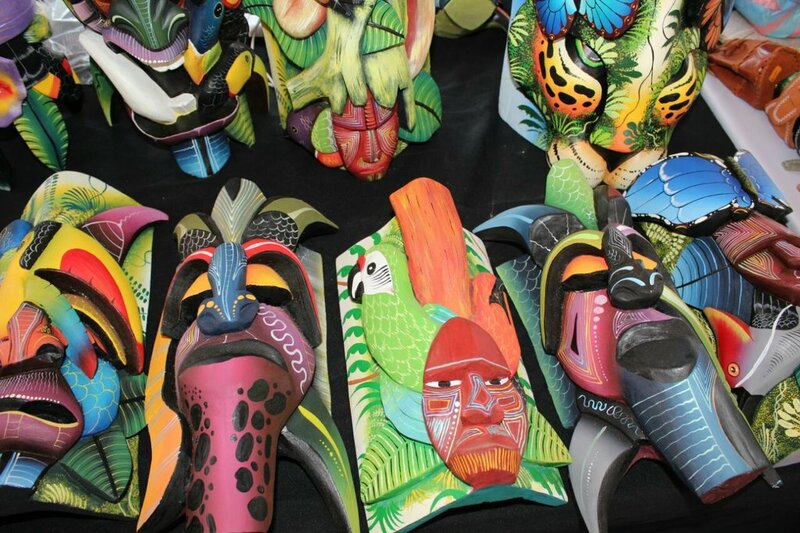 Explore the markets, museums, and architecture of Costa Rica's capital, San Jose. Visit the Caribbean region's largest nesting site for green sea turtles. 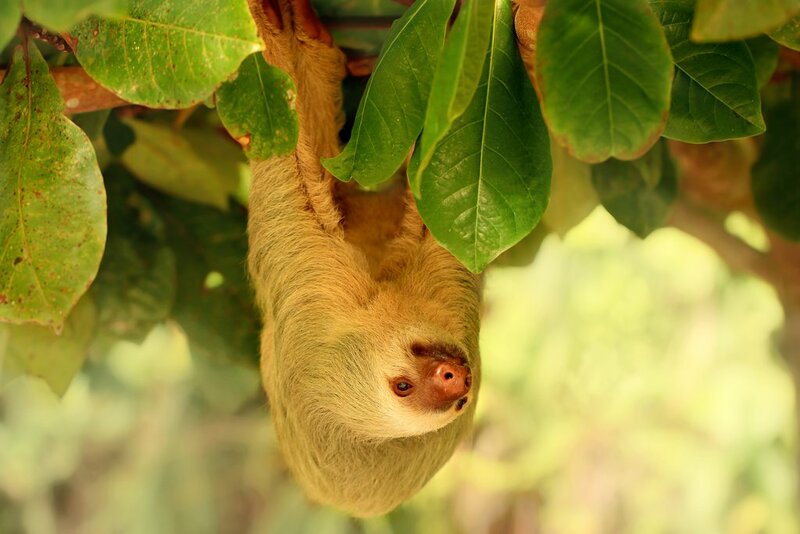 Hike jungle trails in 2 different national parks and see sloths, tropical birds, and other wildlife. Enjoy white-sand beaches and reefs perfect for snorkeling. 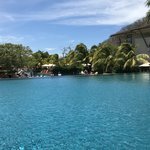 This Costa Rica tour is great for travelers looking to do any of the activities the country is known best for, hiking, nature tours, and tropical beaches. It spans exactly one week, making it a solid option for those who want something more than a quick introduction but shorter than an extensive stay. The itinerary starts and ends in San Jose, and includes many of the Caribbean Coast's best destinations, including a famous sea turtle nesting site and Cahuita National Park. Compared to the Pacific Coast, which many other itineraries focus on, the Caribbean Coast tends to be less crowded, with more cultural diversity. Mercado Central (Central Market): A great way to spend your morning, the central market opens at dawn and is one of San Jose's oldest and most iconic places. Experience the hustle and bustle of daily life, as locals gather to talk politics, buy and sell all kinds of goods, and enjoy generations-old recipes handed down through the ages. Additionally, if you're looking for a last-minute souvenir, this is the perfect place to get something special. Museo del Oro Precolumbino (Pre-Columbian Gold Museum): This museum holds the largest Pre-Columbian gold collection in all of Latin America, all of which is stored underground for protection. Despite the outside, vault-like appearance that leads to the displays, the inside is extensive and well-furnished and is bound to satisfy both history buffs and anyone looking for stunning visuals. San Jose City Evening Tour. 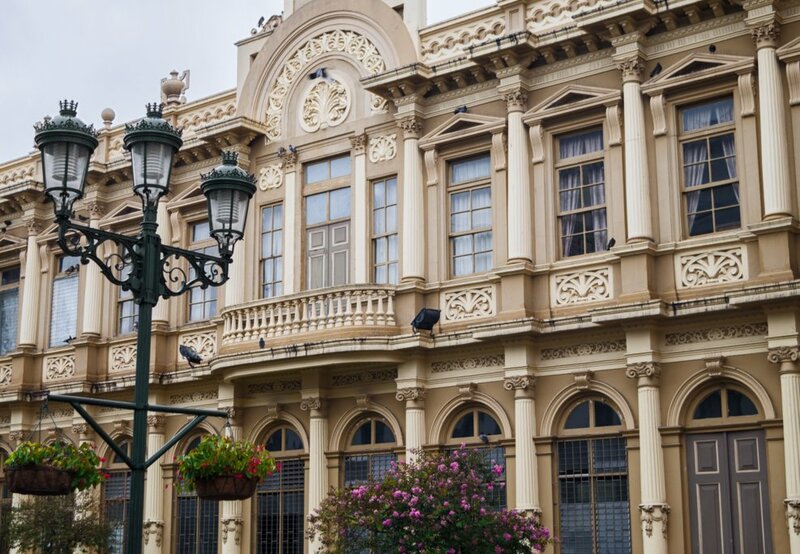 Get introduced to local vendors and authentic cuisine in the Central Market, swing by a series of architectural wonders including the National Theater, and enjoy a fine 3-course meal complete with some of Costa Rica's best wine. Wake up early and begin your 3-day excursion to Tortuguero National Park. Ground transportation will take you from San Jose to Caño Blanco or Finca Pavona, where you will then ride a motor boat to Tortuguero. This is because there are no cars allowed in Tortuguero, so boats are the only means of transportation. 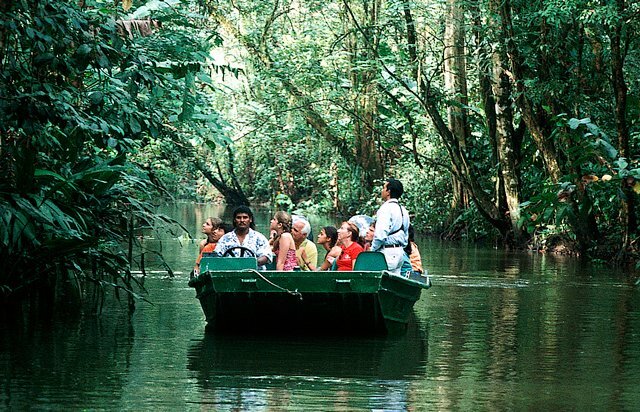 The boat ride into Tortuguero is one of the attractions of the area, along the way, you will see lush forests, crocodiles, sloths, monkeys and various species of birds. After you get in the area, a short guided hike to the town of Tortuguero will introduce you to the local sights. Afterwards, the rest of the day is free for you to relax in your hotel. Then, once the sun sets, green sea turtles may come up to the beach. 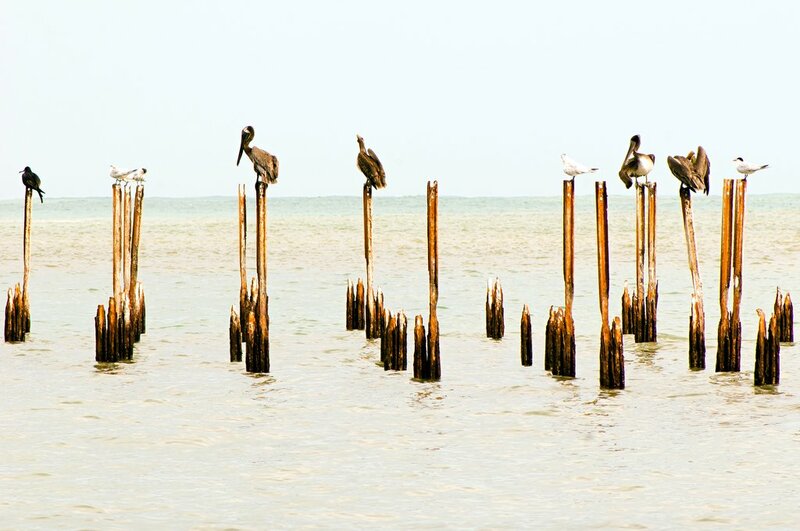 If you happen to visit during the nesting season from June through mid-October, this is one thing you definitely can't miss, as it is one of the Carribean's largest nesting sites. For the first half of the day, take a boat tour through the canals on the park grounds and admire a stunning array of wildlife. Note: Entrance fee to the park is not included. Canopy tour: a combination of zip lines and suspended bridges that will allow you to get up and personal with the flora and fauna around. Fishing: with all the canals near the sea, there are many fishing opportunities. Some lodges will even let you cook what you catch for dinner. Canoeing: You can explore the waterways by yourself by renting a canoe. This way you can explore some of the areas that are a bit hard to reach by motor boat. If you are interested, there is even a night boat tour. You will meander down the canals in the darkness and the guide will shine a spotlight to show you the nocturnal animals, including crocodiles, frogs, caimans and bats. 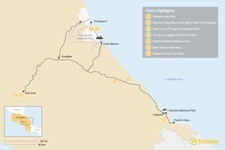 After breakfast, you will be transferred by boat and car to the town of Guapiles. Eat a tasty local lunch, then spend the rest of the day getting to Puerto Viejo, located on the South Caribbean coast. 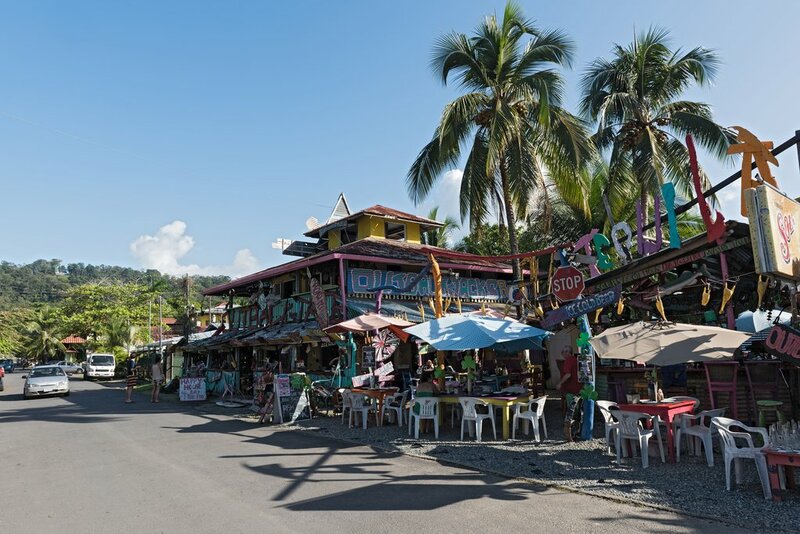 With residents of both an Afro-Caribbean descent and indigenous descent, Puerto Viejo de Talamanca has a vibe that is different to other beach towns in Costa Rica. You will see colorful homes, hear reggaeton beats, and a general laid back attitude. Enjoy the evening in Puerto Viejo and the great array of restaurants and nightlife it has to offer. Don't forget to try the coconut rice which is famous here. 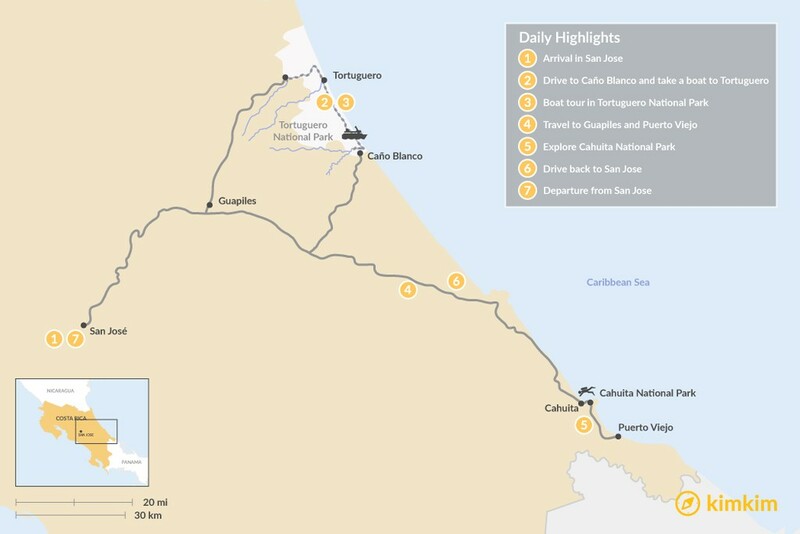 Start your day with a hike in Cahuita National Park, following a winding jungle trail beginning from the community of Cahuita. Cross through beautiful white-sand beaches up by Cahuita Point, where tourists can relax and go for a dip in the tranquil waters of the Caribbean Sea. Then, set off to spot various types of snakes (boas, bocaraca, bush master, eyelash vipers), sloths, white-faced and howler monkeys, anteaters, armadillos, raccoons, blue morpho butterflies, birds, medicinal plants, orchids, and all types of tropical trees. After the hike, embark on a boat trip from the vibrant coast of the National Park to a colorful coral reef for some snorkeling. Then, head back to park grounds for a picnic-style lunch (sandwich, fruit and drinks) on the shore, complete with amazing views and the fresh sea breeze. In the afternoon, hike another nature trail, this time in the company of a professional guide who will fully explain the range of flora and fauna in Cahuita National Park. Take your last full day to relax in the morning, finish exploring the National Park, and enjoy the beach. By noon, you hit the road to transfer back to San José, where a hotel will be ready for you on your last night. If you didn't get to visit any of the local attractions or attend the night tour in San Jose, now is your chance. Alternatively, you can discover the capital's exciting nightlife scene and end your tour with a blast! It's time to say goodbye to Costa Rica. A representative will meet you at your hotel and drive you to the airport for your return flight home. The booking process was easy; Randall was very responsive and able to fulfill all our requests. All activities were well organized and transfers ran smoothly. Costa Rica's beauty takes your breath away! Our Tortuguero guide Rolando from the Laguna Lodge hotel was one of the best ones we've ever had. We even saw a giant sea turtle lay eggs - such a wonderful experience. Thank you!